Between their two year tenure on EMI's Harvest Records imprint from 1971-73 and the beginning of their long association with Jet Records from 1975 onward, the Electric Light Orchestra (ELO) - and, of course, Wizzard - were signed to Warner Bros. Records in the UK. Yet their time on WB and its famous palm tree lined Burbank label marked something of a downturn in both of their fortunes. The botched exit of Wizzard from Harvest to Warner Bros. during the release of "I Wish It Could be Christmas Everyday" in late 1973 quite probably cost it a place at the chart summit alongside Slade and was sadly a sign of things to come. 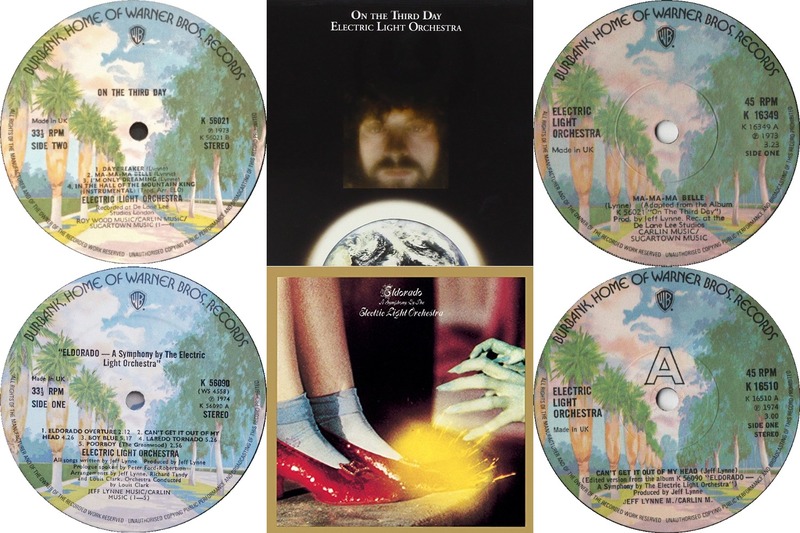 ELO had enjoyed reasonable album chart success in UK with Harvest with their first two albums reaching #32 and #35 and their first three singles "10538 Overture", "Roll Over Beethoven" and "Showdown" attaining #9, #6 and #12 respectively (The Move also charting regularly with "Tonight", "Chinatown" and "California Man"). However, the first ELO release on WB, the gatefolded "On The Third Day" (K56021) failed to chart with lone single "Ma Ma Ma Belle" (K16349) managing a modest #22 in the singles chart. Even more disappointing was the fact that their much cherished fourth album, their second Warner Bros. release: "Eldorado - A Symphony by The Electric Light Orchestra" (K56090) also failed to chart in their home country as did a foreshortened single edit of "Can't Get It Out Of My Head" (K16510). Yet, whilst their chart performance here in the UK was stalling, the opposite could be said of their fortunes in the US as a Jeff Lynne led ELO reaped the benefit of the "Do It With The Light On" campaign, relentless touring and their staying with LA based United Artists Records during the same period. Indeed, both "On The Third Day" and "Eldorado" made the Billboard 100 (at #52 and #16), the latter earning ELO their first gold disc whilst the dreamy "Can't Get It Out Of My Head" peaked at an impressive #9 in the US Top 10. The contrast between their growing popularity in the States and their home audience being somewhat unappreciative was stark. Hoping to build upon their growing reputation as a live act, ELO's concert at Long Beach Auditorium was recorded on Sunday 12th May 1974 and was intended to follow the release of "On The Third Day" but was deemed of insufficient quality to be released in the both the UK and US. "The Night The Light Went On (In Long Beach)" did eventually find release in Germany via Warner Bros. (WB56058) becoming a much sought after import for avid ELO fans - including Yours Truly KJS! Interestingly, three tracks from the abandoned live LP: "10538 Overture", "Daybreaker" and "Showdown" ended up as the 'B' sides to "Evil Woman" (JET764), "Nightrider" (JET769) and "Strange Magic" (JET779), the trio of singles taken from "Face The Music" (JETLP11), after ELO had jumped label again here in the UK and Europe to Jet Records. A repackaged "The Night The Light Went On" finally saw official release in the UK in 1985 via Epic Records (EPC32700). Hard to believe that Eldorado never charted in the UK. My god, were people walking around with their hands over their ears? What a travesty. Unbelievable.....There are so many unfortunates who have never heard that great album.